The weather is as unpredictable as a craps table in Las Vegas. One roll you're up a couple hundred dollars and 10 minutes later you're hitting the only machine in Vegas that guarantees a pay out – the ATM. Such is so with the weather! We are told it will be sunny with a chance of clouds and a half hour later we are caught in the rain without a jacket. With all the advances in weather technology and local News Stations using fancy-named machines like the Live Megadoppler 7000, why is there still a lack of precise weather forecasting? Outside of professional baseball, is there any profession that accepts such mediocre performance / accuracy rates? Highly doubtful. As the title states, it's time to ditch the weatherperson and remove the reliance on local News for our weather. 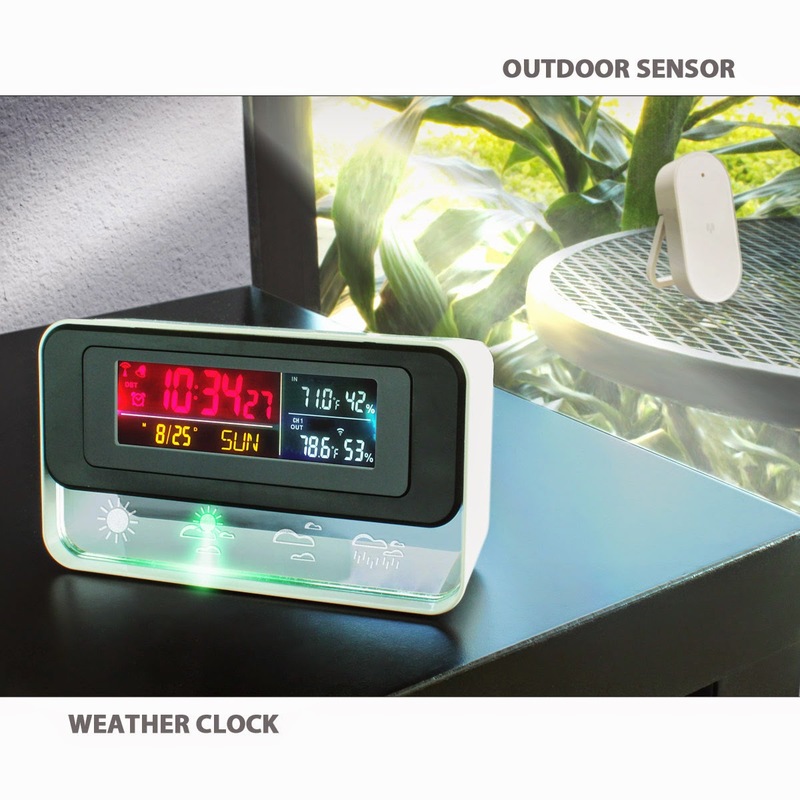 Introducing the ENHANCE Ambient Weather Station and Digital Alarm Clock. Unfortunately, not all of us have the energy to wake up and see that glorious sunrise every morning. With the ENHANCE Weather Clock you don't have to! The dazzling multicolored LED brings the beauty of the sunrise into the bedroom and onto your mantel. It even displays the time, date, day and weather in crystal clear detail! By using the wireless outdoor Barometric sensor, which utilizes Barometric Air Pressure Technology, this device will be able to provide you with the indoor and outdoor temperature along with a 24 hour weather forecast. This makes the weather guessing game obsolete. Never get caught in a blizzard while wearing shorts again! Not only is the ENHANCE Weather Clock great for predicting the weather; it also operates as an alarm clock complete with a snooze button. Wake up refreshed and informed with the day's weather information. Never again worry about snoozing too long - it's almost impossible to sleep after waking up to such a beautiful LED display. The weather station can be powered by three AAA batteries for portable use or as a backup for power outages. With all of its capabilities, the ENHANCE Weather Clock is the perfect desk or nightstand companion. Visit www.accessorygenie.com for more information on the ENHANCE Weather Clock. If you want to be in the know about great deals, you can sign up for our Weekly Newsletter! That's where you'll be the first to know about new products, special discounts, exclusive promotions and more! Don't forget to subscribe to us on YouTube, like us on Facebook and follow us on Twitter for even more great deals!